Today, Secretary of Defense Leon Panetta issued a whitepaper outlining the budgetary implications of the Obama administration’s new defense strategic guidance and Congressionally-mandated deficit reduction measures, including the effect on some U.S. nuclear weapons strategic delivery systems. The Pentagon whitepaper only calls for delaying procurement of a new, proposed Ohio-class replacement nuclear-armed submarine by two years, which could (according to earlier Pentagon figures) save some $6-7 billion in the next ten years, but would not reduce the overall cost of the program, which the Pentagon puts at an estimated $350 billion or more over its 50-year lifespan. The delay in the new strategic submarine program is a step in the right direction, but falls short of the more significant savings that can be achieved by rightsizing U.S. nuclear forces to reflect the realities of the new century. For more significant savings, the Pentagon must reduce the total number of new subs it plans to buy in the coming years. By delaying procurement of new replacement subs by two years as now planned, and by reducing the current Trident nuclear-armed sub fleet from 14 to eight or fewer boats, and building no more than eight new nuclear-armed subs, the United States could save roughly $20 billion over 10 years, and $120 billion over the 50-year lifespan of the program. The delay does mean that long-range budget decisions on the new strategic sub and other strategic nuclear weapons systems will be determined by updated Presidential nuclear weapons policy guidance, not the other way around. The additional time should also allow the Pentagon to evaluate other options for the nuclear-armed sub force that can more substantially reduce costs while maintaining a formidable nuclear force. Carter also emphasized that the Pentagon has chosen to move forward on schedule with its proposed new long-range heavy bomber program. This represents a missed opportunity to break with outdated thinking. Work on a new strategic bomber should be delayed. There is no rush to field a fleet of new bombers given the Pentagon’s plan to retain 60 of its existing nuclear-capable, long-range B-2 and B-52 bombers into the 2040s. Delaying work on the new bomber program would save $18 billion over the next decade, according to the Pentagon. It is now up to President Obama to follow-through and make long-overdue changes to outdated U.S. nuclear weapons policy, which can lead to further budget savings. Today, more than 20 years after the end of the Cold War, U.S. and Russian nuclear arsenals still exceed what is reasonably necessary to deter nuclear attack. The United States deploys 1,790 strategic warheads, while Russia deploys 1,560 strategic warheads. Each side possesses thousands more warheads in storage. No other nuclear-armed country deploys more than 300 strategic warheads; China has no more than 40 to 50 warheads on intercontinental-range missiles. 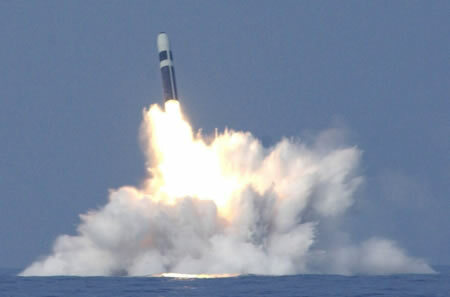 Just one US nuclear-armed submarine could devastate an entire nation and kill millions. Rather than maintaining obsolete arsenals that they neither need nor can afford, leaders in Washington and Moscow could pursue further, reciprocal reductions in their overall strategic nuclear forces – to 1,000 warheads or fewer each – and still retain more than enough megatonnage to deter nuclear attack by any current or future adversary. For more a more in-depth discussion of these issues see “The Future of the U.S. Nuclear Arsenal,” an Arms Control Association briefing held on January 20. This entry was posted in Nuclear Weapons and tagged Defense Strategic Guidance Review, Presidential nuclear weapons policy guidance, U.S. Defense Budget. Bookmark the permalink. Excellent discussion but what remains unclear to me is where the remaining nuclear weapons and systems are to be targeted. The strategic bomber program is certainly an anachronism. And as you rightly point out these expensive white elephants are unjustifiable from a strategic prospective given the existing hardware. Also I would like to see a discussion of the Department of Energy’s $85 billion boondoggle on nuclear weapons modernization. It seems to get a pass because it is managed outside of the DOD budget. Nuclear weapons modernization should be addressed within the context of all informed analysis of the US arsenal and nuclear weapons delivery systems.